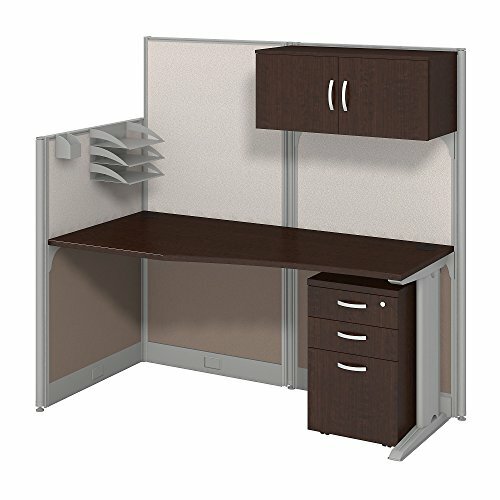 Create an efficient, organized workspace in a matter of minutes with the Bush Business Furniture Office in an Hour 65W x 33D Cubicle Workstation with Storage. The office desk combines a thermally fused laminate surface with sturdy steel legs to resist scratches, stains and damage. In addition to the desk, the workstation includes one 48H and two 63H cubicle panels, along with all necessary hardware. These metal-framed panels are covered by stylish two-tone fabric. The desk and cubicle panels include adjustable levelers to compensate for uneven floors. A convenient cable management system features desktop grommets and removable panels in the metal legs for organizing cords. Keep your supplies and documents in order with the included Storage Cabinet, Adjustable Paper Tray, Pencil Cup and Mobile File Cabinet. The assembled Storage Cabinet mounts to a 63H Panel and includes necessary hardware. The Mobile File Cabinet drawers open on full-extension ball bearing slides for a smooth and easy reach to the back. Two box drawers work great for personal items, pens and paper, while a file drawer holds letter and legal-sized folders. The Paper Tray and Pencil Cup mount to the 48H Panel to further organize your work surface. Turn open spaces into efficient offices with this easy-to-assemble workstation. Meets ANSI/BIFMA standards for safety and performance. Commercial quality backed by a 10 Year Manufacturer's Warranty.